Three pairs of tights and two books. I can remember exactly what I bought, because I then left the whole lot under the seat on the train I took from Kings Cross station to Harpenden. Two penguin novels and three pairs of Wolford tights that cost an arm and a leg. I realized my hands felt empty as, standing on the platform, I watched the tail of the train disappear into the dark distance on its way to the next station. I stood for quite some time on the cold platform, my breath white, feeling bereft and furious with myself. Of course the ticket office was closed and anyone who could help long gone. Back at my parents, a recorded message informed me that the lost property office was closed until nine o clock on monday, by which time I would be back in Rome, without any Wolfords. I just hoped whoever found the bag appreciated they had found sixty flipping pounds worth of tights that, if washed by hand, would retain their shape and make legs look good for years to come. I’d bought both books and tights from Selfridges on Oxford street. It must have been late 2006 because I’d been living in Rome about a year and a half and was just about able to distinguish the roman intonation of the assistant helping me choose between matt opaque and silky effect. In between discussions about investing in good quality tights and stomach support, we talked about her home town and my new home, Rome. Quickly the discussion turned to food, or rather the assistants longing for a suppli and plate of cacio e pepe from Felice on via Mastro Giorgio in Testaccio. Via Mastro Giorgio was where I lived I told her, three buildings up from Felice. By the time we reached the cash desk, the helpful but initially cool assistant almost had her arm around me, a gesture which seemed to sum up so much about Romans and their relationship with Roman food. As she put the tights in the bag, she asked me to eat a plate of cacio e pepe from Felice for her. Cacio e pepe, cheese and pepper, is one of Rome’s iconic primi piatti, a pasta dish that sums up the simple, thrifty brilliance of the city’s traditional cooking. Pasta tossed vigorously with grated pecorino romano cheese, black pepper, pasta cooking water and possibly olive oil until the ingredients come together into a pale creamy sauce flecked with black that clings seductively to the pasta. Simple yet disconcertingly difficult to get right – there is a fine line between clump and cream – but utterly delicious when you do. Like most Roman dishes, opinions and about how to make cacio e pepe are strongly held, the addition of olive oil being a particularly contentious point. There is also a very good chance whoever you are talking to, their mother, their grandmother, or their brother makes the definitive cacio e pepe. Feelings are just as strongly held about where good cacio e pepe is served. The girl who helped me choose tights and my wise friend Laura think trattoria Felice makes a fine plateful. My neighbours don’t agree. Their favorite, after their own, is to be found at the trattoria with frosted glass windows on via Marmorata, Perilli. ‘Perilli oh no‘ howled another friend in disagreement! ‘Go to Flavio Al Velavevodetto for cacio e pepe‘. Cacio e pepe advice has been particularly plentiful for us, living as we do, in the heart of opinionated Testaccio just three doors down from Felice, a corner away from Perilli, 200 metres from Flavio, two corners from Agustarello and three from La Torricella. In short, bang in the middle of a cluster of historic Roman trattorie all serving up opinion stirring cacio e pepe with opinion stirring service. 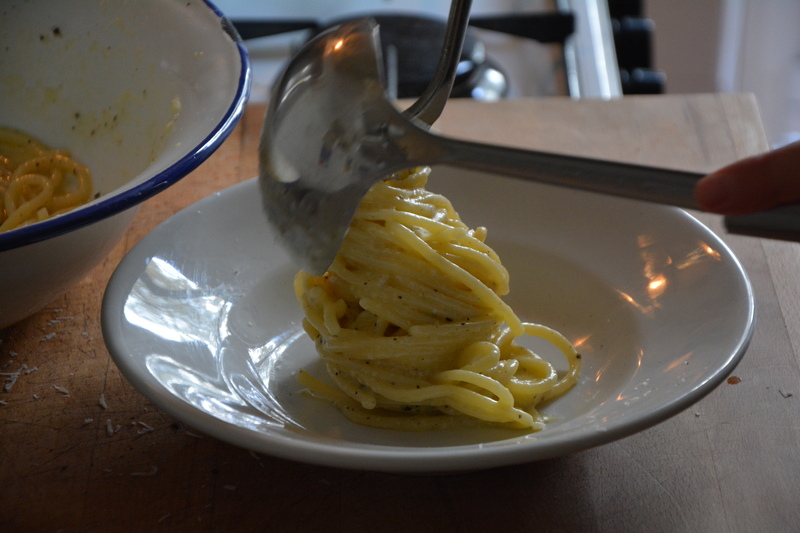 We tried them all, and slowly I began to get a sense of cacio e pepe. Over time I realised I favour long pasta coated with enough creamy sauce to allow the strands to twirl easily around the fork and tongue, just enough freshly cracked pepper to catch the back of your throat and extra pecorino dusted on top. These days I tend to avoid Felice, the cacio e pepe may be good, the service less so. I have soft spot for the cacio e pepe at Flavio and Agustarello (even though Sandro can be a tricky.) Leaving the confines of my cheese shaped quarter I also really like cacio e pepe (and the service that accompanies it) at Cesare al Casaletto and Armando al Pantheon. Eating out is all very well, however most of the time we eat in, so I wanted to make my own cacio e pepe, which proved much harder than I imagined. You need a teacher Vincenzo said, a good one. So a week last Tuesday, I stood in my small kitchen with my roman friend Paola, who happens to be a chef, and she showed me how she makes cacio e pepe. First she laid out the equipment: a large bowl, a metal fork , a ladle, a small frying pan, pestle and mortar and a large pan for cooking the pasta. Next the ingredients. ‘The black pepper is vital‘ Paola said holding out a handful of Sarawak black peppercorns bought from the Emporio delle spezie almost underneath my flat. ‘Eat one‘ she urged. So I did, a whole peppercorn popped in my mouth like a sweet. Once bitten it was softly fragrant and almost tea-like until the spicy heat hit the back of the mouth and a fragment got caught in a molar. 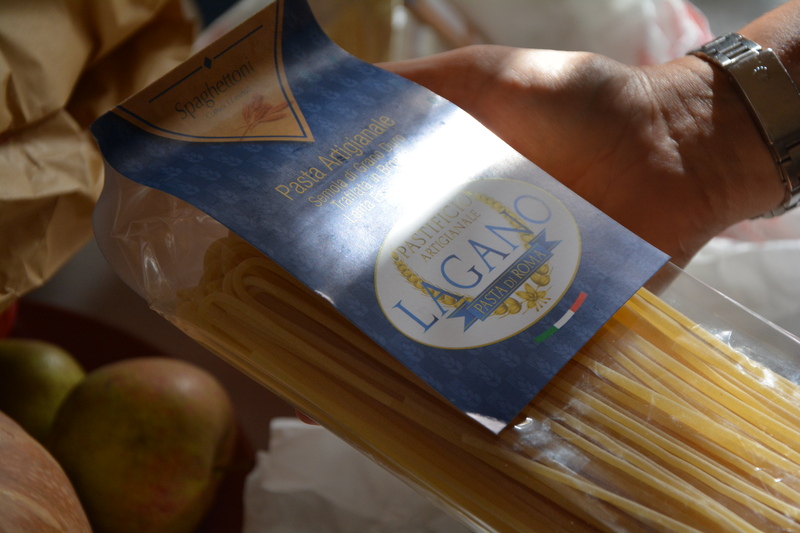 For pasta, Paola had chosen a long dried pasta made in a small independent pastificio (dried pasta maker) called Lagano here in Rome. Last but not least, there was the pecorino romano from Antica Caciara in Trastevere, which was exactly how you hope it would be, creamy, muttony and a bit impertinent. I have always enjoyed watching other people cook, especially those who are confident but gentle about the way they do things. 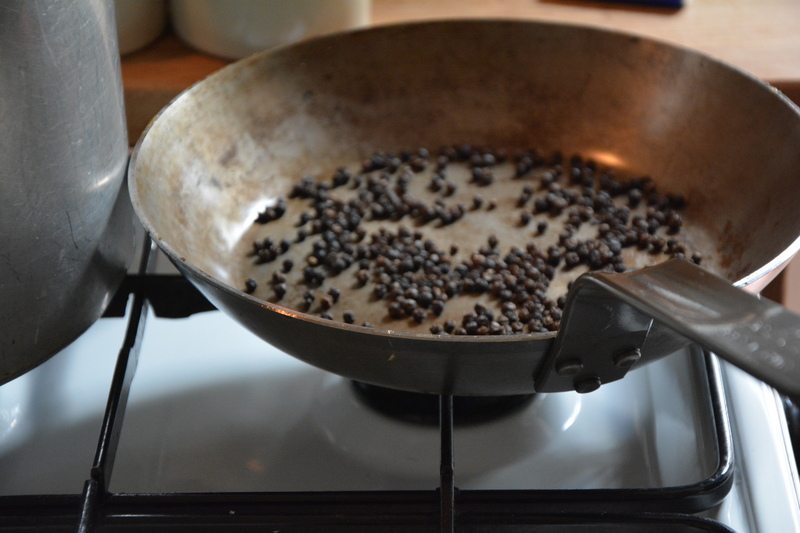 Paola toasted the peppercorns in an iron pan until their fragrance opened up and swirled into the kitchen. Then she crushed them into speckled powder by hand in my make shift bowl/rolling-pin pestle and mortar, which she noted worked extremely well. While the Pasta cooked in well-salted fast-boiling water she grated the pecorino into a soft, pale mound that just begged to be pinched. Once the pasta was about half way there, she ladled a surprisingly generous amount of pasta cooking water, by now cloudy and slightly thick with starch, into the large bowl. To the water she added a golden glug of good olive oil and then whisked the two together quickly with the fork. ‘It needs to cool a little’ she noted. ‘Or it will make the cheese seize and clump.’ Once the pasta was ready, she lifted it into the water and oil mixture. Then came movement: with one hand Paola began a firm beating/swirling movement with the fork, with the other she added the cheese, handful by handful, followed by a generous amount of pepper. The vigorous beating continued for at least a minute, the strands of pasta, pasta cooking water, cheese and pepper swirling, around the bowl until they all came together, emulsified into a sauce. Plates, piles of pasta, a little more pepper, a tavola! The sun streamed and the noise of the traffic and kids piling out of the nearby school crept through the window into my small kitchen as we sat at the kitchen table eating cacio e pepe. We talked about Rome and roman food and how with dishes like this it is all about practice, about trying, possibly failing and trying again in order to discover how much pasta cooking water, how much cheese and pepper, how vigorous is vigorous. In short, finding your way of doing things. Paola was keen to remind me this was her way of making cacio e pepe, that she toasts her peppercorns while others don’t, that she adds olive oil while others don’t, that she mixes in a bowl while others prefer a pan, that she likes dried pasta while others favour fresh. In short, Paola, like the seven generations of her Roman family before her, has found a way that works for her. It was absolutely delicious. I needed to fail at making Cacio e pepe in order to succeed – seeing how the cheese can clump and harden into strings (which is usually because the pasta or cooking water is too hot) allowed me to find a smoother way. Since our lesson I have tried this recipe three times with fine results. You really do need to beat and toss the cheese, pasta and pasta water together boldly – think of the movement as a combination of whisking egg and and tossing salad – for quite some time – it took a good minute the other day. Don’t be put off if you see a clump: keep on, adding a little more pasta cooking water and cheese and mixing as if your life, or rather your supper depends on it. You can of course try without olive oil. a large pan, a large bowl, a grater (I like my microplane), a large fork, a ladle. Bring a large pan of well-salted water (10 g of coarse/kosher salt for every litre) to the boil. Meanwhile toast the peppercorn gently in a small frying pan until the fragrance and essential oils open up. Crush the toasted peppercorns in a pestle and mortar. 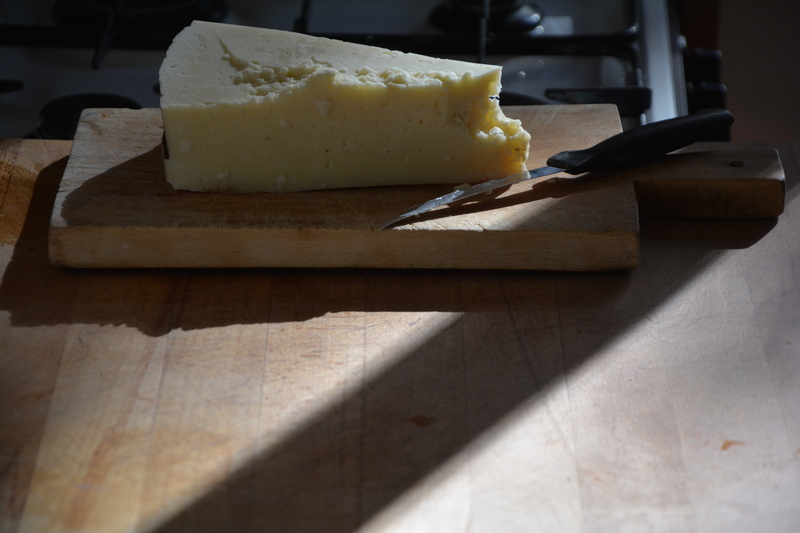 Grate the cheese, finely, onto a plate. Once the water is boiling, added the pasta and make sure it is submerged. Check the pasta cooking time and the clock. Once the pasta is half-cooked lift a ladleful of pasta cooking water into the bowl, add two tablespoons of extra virgin olive oil and whisk the two together vigorously. 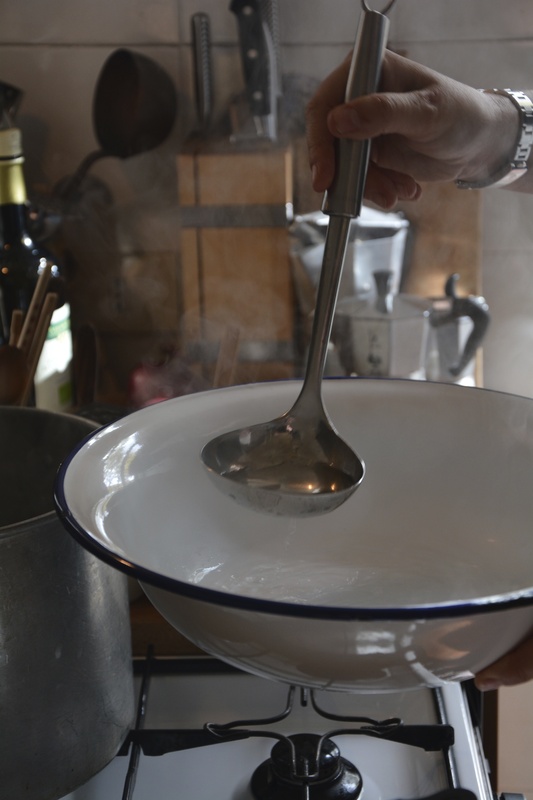 Once the pasta is a minute off its cooking time, lift it into the bowl, ideally using tongs or a sieve. Swirl the pasta in the water and oil. Now using one hand to beat the pasta with the fork, use the other to start adding the cheese, handful by handful. Keep beating and swirling the pasta with the cheese until you see a cream starting to form. Once the cheese is all added, add a teaspoon of the crushed pepper. Keep beating. Add a little more pasta cooking water if necessary. Divide between plates, top with another pinch of pepper, a dusting of cheese and eat. Toasting the peppercorns is a wonderful idea. I shall try that next time. It is such a good idea, really bringing out the flavor and natural oils in the pepper. 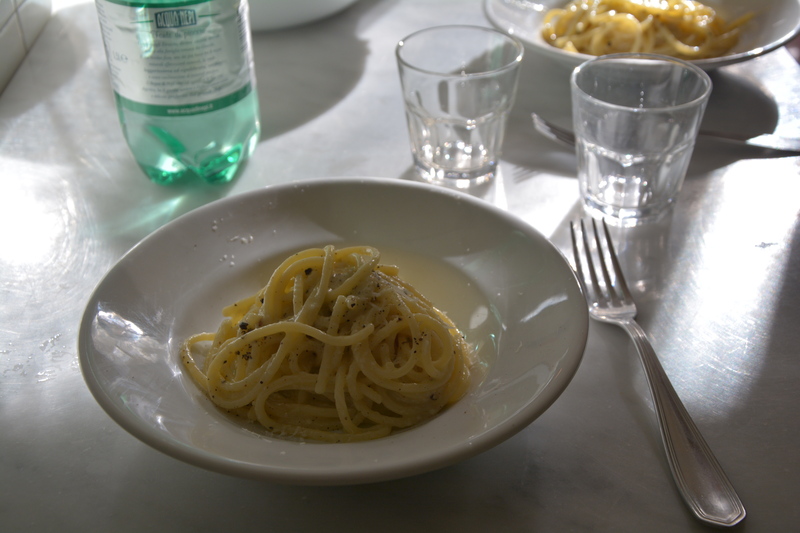 Reminds me of the many bowls of cacio e pepe we tried in Rome. In Testaccio too. My Roman students had handed me strips of paper with very specific, vociferous advice. I reckon it’s important to stress that one of the key things for mastering cacio e pepe is the that cheese needs to be really finely grated. My micrograter is just a step up from “very fine” and it’s just not ideal. Toasting the peppercorns – great Rachel. Brilliant! Now I understand why the few times I have tried to make this the cheese formed weird clumps. Thank-you and Paola for the step-by-step instuctions. Now to mourn the long lost books and tights, two of my favourite things. 9 months later, the stars finally aligned and I bought some pecorino romano and proper pasta from the Italian deli. Had some sarawak pepper even, that a student brought me from Malaysia. And despite the very stressful stirring and almost but not quite clumping, a beautiful plate of cacio e pepe resulted. Though of course I am already thinking about how I can improve on it next time. Thank-you! So different from the way I’ve ever done it! I’m of the school of no oil, and then hot water and cheese on top of the pasta. But can’t wait to try out this method soon. Also, I love the toasting of the peppercorns. Genius. I do it all the time for Indian dishes, of course, it just never occured to me to do it for Italian. Duh! My mouth is watering! Having attempted this dish several times from an ‘ordinary’ recipe, I was delighted to have your careful and thoughtful instructions. Any thoughts on whether it’s better, worse, or just different, with the addition of guanciale? Cacio e pepe is my husband Mark’s favorite dish. He is on a mission to try it at every restaurant in town I think! Somehow we have never made it to Felice (I am a Flavio fan) but it is now most certainly on the list. Oh, Rach. If only you’d been on the Hogwarts Express you would have retrieved those tights with a wave of your wand! I love this dish and have eaten it in three restaurants in NYC. Two with fresh tonnarelli (Gusto and Morandi) and one with bavette (Mario Batali’s Lupa) – all delicious. I will make your recipe at home this weekend after I live through Thanksgiving. I have tried and failed at Cacio e Pepe some many times but am newly determined and inspired by your post, especially the bit about practice, practice, practice. I think an in-house Paola would be helpful for me. I also love your restaurant recommendations/discussion. I will be in Rome and may and would love to hear more about places you like. oh my, you are such a fine storyteller & cook. I MUST try this prep after Thanksgiving. Thanks for both! Rachel, you make me wish I was back in Testaccio and wandering along the streets to Felice! Unfortunately I never got to meet you when I was visiting Rome in August, and unfortunately I’ve never tried cacio e pepe. I’ll either have to try your recipe one day (or Paola’s rather), or make a trip back to Rome! Both sound like fantastic options. Absolutely adore cacio e pepe. I ordered it almost every single time we went out in Rome for the three months I was there. Definitely a deceptively simple dish. You made the beginning of this post quite a thriller: I thought you were just back from England and lost all that money ‘whilst we were sleeping’ 🙂 ! Love the dish but can’t remember having made it myself . . . shall try . . .and with the suggested Sarawak peppercorns: know I can access those 🙂 !! Nothing is as complex as simplicity. Great post. I bought an enormous wodge of pecarino in testaccio market, and slowly destroyed it over the week of our stay. That was a great week. Sigh. Enormous wedges of cheese are the way. I love to cook, but I call myself the “lazy cook” as I always drift to the simple, just a few ingredient recipes, not at all interesting is spending all day making supper so your recipe and instructions are so appreciated. 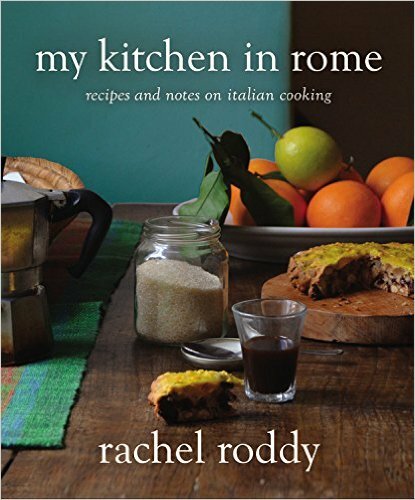 I am adding this to my book of recipes that are no doubt even more delicious than they even sound and look…Thanks and Happy December in Rome. Beautifully written and heartwarming, you have such wonderful style Rachel! Un abbraccio, B.
I ate Cacio e pepe my first night in Rome. I hadn’t set out to. It just happened. It was glorious. So glorious that I am at a loss to what Roberto ate. I do know that we followed our pasta with fish and potatoes bathing in the most luxurious olive oil. I digress. I think it is time to make it at home. Rome seems so far away. come back to Rome, this time we will make cacio e pepe together. I’ve just discovered this blog. Before reading another post I had to make myself a large bowl of pasta – at close to midnight, on a Sunday. I am sure I will be up very late discovering your writing, and will be all bleary eyed and half-brained at work tomorrow but it will be worth it! Cacio e pepe has long been one of my family’s favorites even though I have been making it wrong all these years. I tried your recipe last night and even though I need more practice with the incorporation of the cheese, the difference between this and what I had been making was AMAZING! I look forward to making this many times in the future and perfecting my technique. Thank you! I so love your writing. LOVE. IT. Hi Rachel! I wrote you before regarding another cacio e pepe recipe where the cheese ceased up on me and formed into big clumps. This recipe worked so much better. You do have to stir it really vigorously – when we stopped stirring for one second it started clumping and we had to go at it again! When we stirred it really fast and added a little pasta water when it looked thick, it turned out great. Thanks so much for updating this!! It really brought us back to rome. You have the greatest cooking blog. 1. What should the ratio of pasta water to olive oil when you first mix the two? 2. Should the liquid be totally absorbed when the dish is ready to be served? I had a puddle of creamy/peppery water at the bottom of my serving dish the last time I made it. 3. I have read many cacio e pepe recipes which call for butter, not olive oil. What are your thoughts on butter? 4, Is there a a way to unclump cheese once it has clumped together?